As I was making my purchases, these little buggars began to develop their reputation as strawberry thieves. 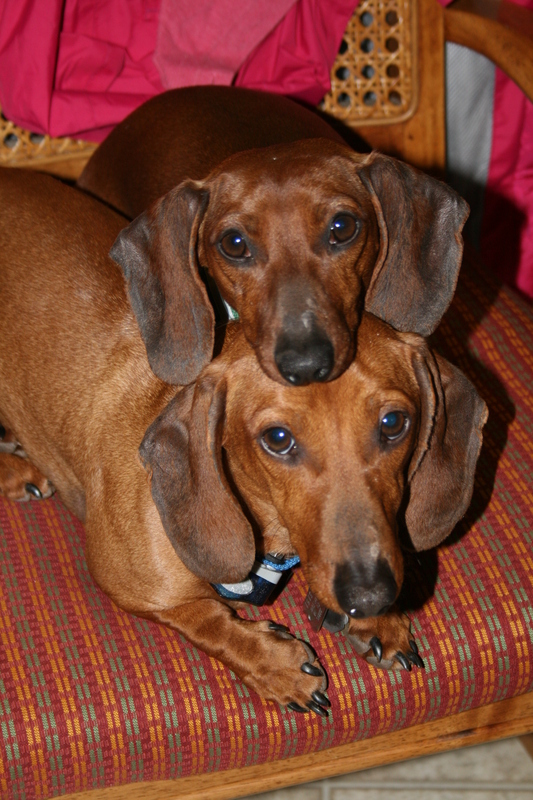 They’re cute, they know it, and they use this to their advantage. 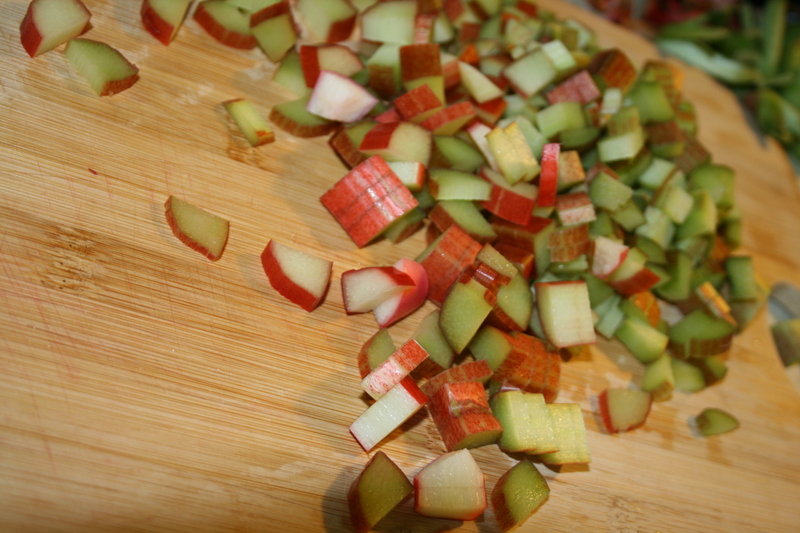 A rather tart red-green stalk, rhubarb is commonly made into pies with a boatload of added sugar. 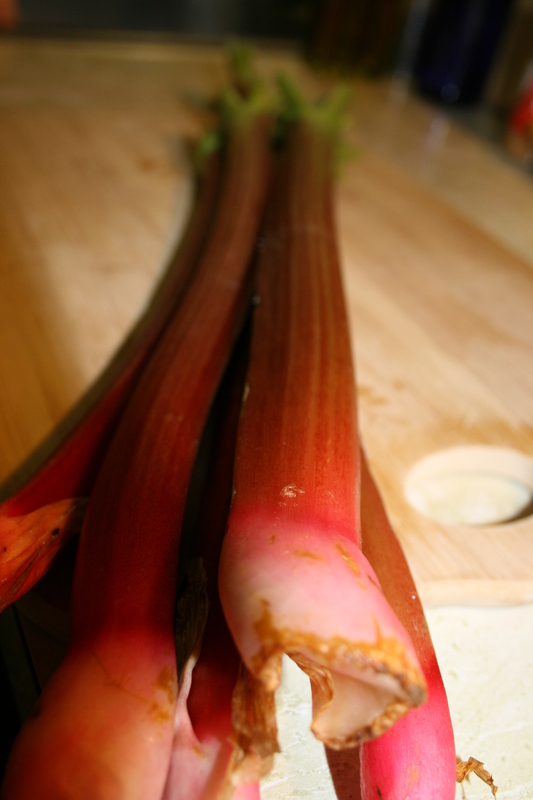 I dig this recipe because it doesn’t have too much sugar and the rhubarb provides a nice kind of tangy contrast. I will contend that the number one most awesome way to get muffin batter into muffin tins is to use an ice cream scoop. Try it. You can thank me later when you can use the extra time you aren’t scrubbing baked on muffin batter off the muffin tin to watch some trashy tv. Preheat oven to 375 degrees. Combine the flour, baking soda, baking powder and salt thoroughly in a medium bowl. Combine the buttermilk or yogurt, brown sugar, oil, egg, and vanilla well in a large mixing bowl. Stir in dry ingredients until just moistened. Stir in rhubarb and nuts if using. 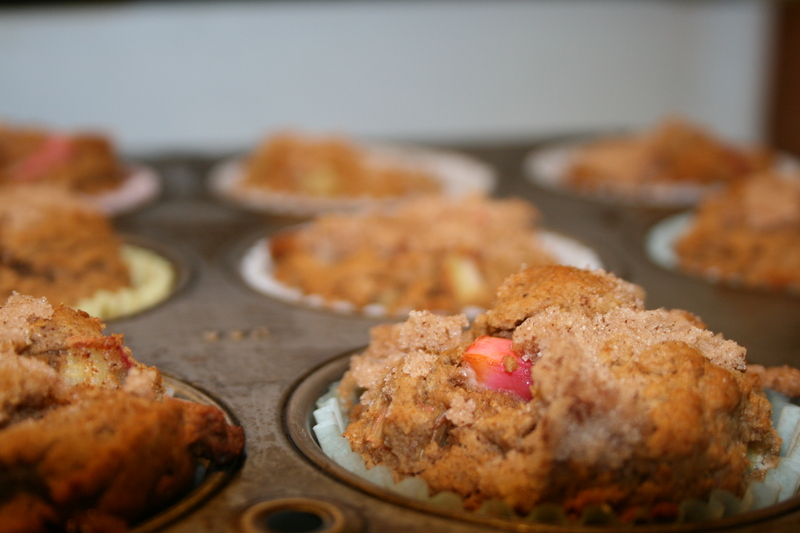 Fill greased or paper lined muffin tins 2/3 full. 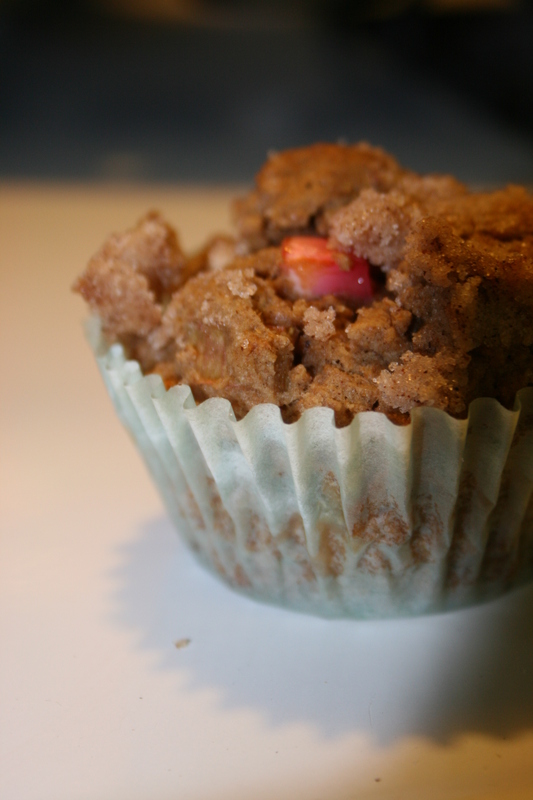 Combine crumble ingredients and sprinkle on top of batter. 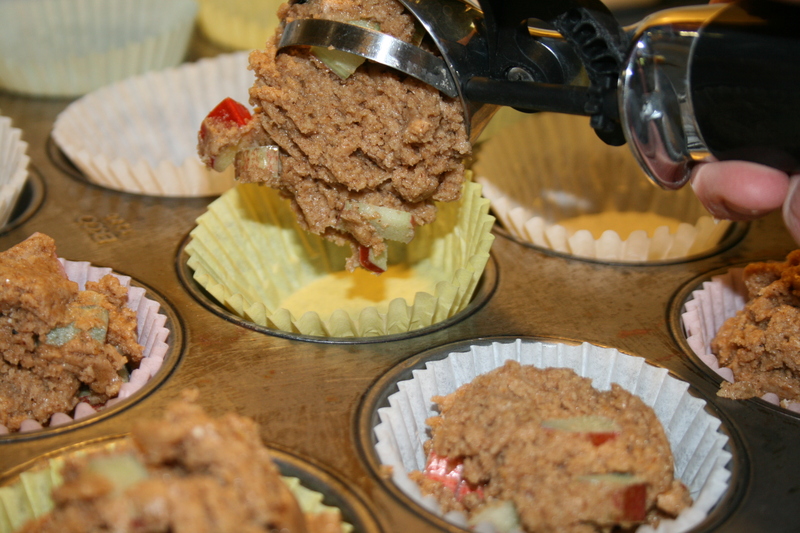 Bake prepared muffin tins until toothpick inserted in center comes out clean, about 20 minutes. Remove from pans and cool on wire racks. Makes about 18. Recipe from Simply in Season. Farmers’ Market season opened here in Gettysburg on Saturday and I couldn’t resist stopping by the market on the square to pick up some seasonal favorites, like these guys. I will contend that all things vegetable (and many things fruit) taste better roasted. And many of these are further improved with the addition of goat cheese. 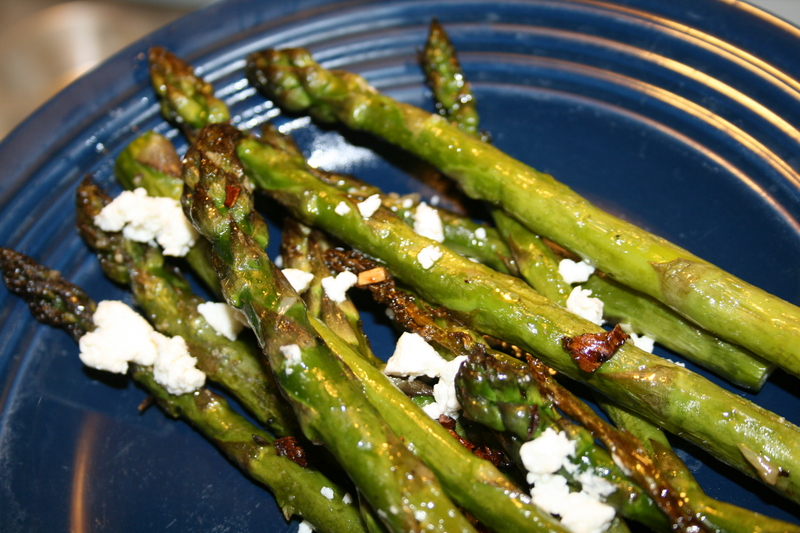 Case in point: Garlicky Roasted Asparagus with Goat Cheese. 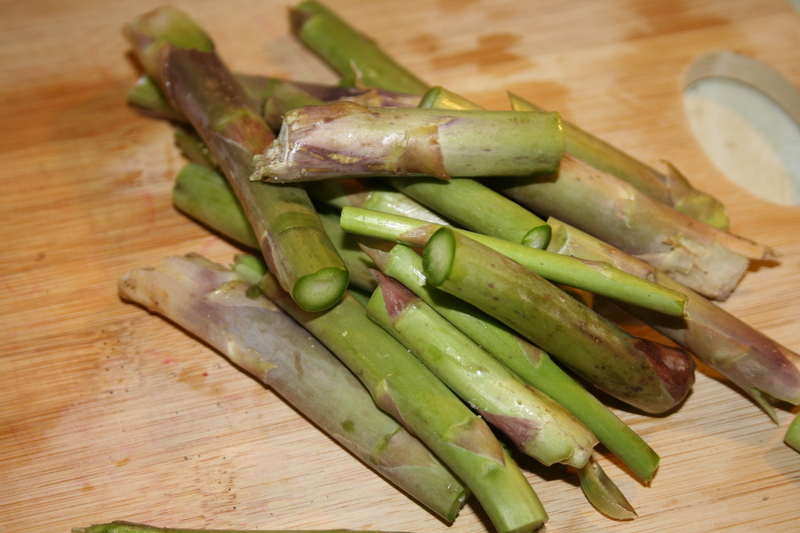 Whenever you’re cooking with asparagus, you’ll want to break off/cut off the thick, woody ends, which can be tough. It seems a shame to waste a good portion of the stalks, so I’ve started saving my veggie trimmings in a freezer bag to make vegetable stock later. Make sure to pause to enjoy any mega-cuteness occurring behind you in the kitchen. 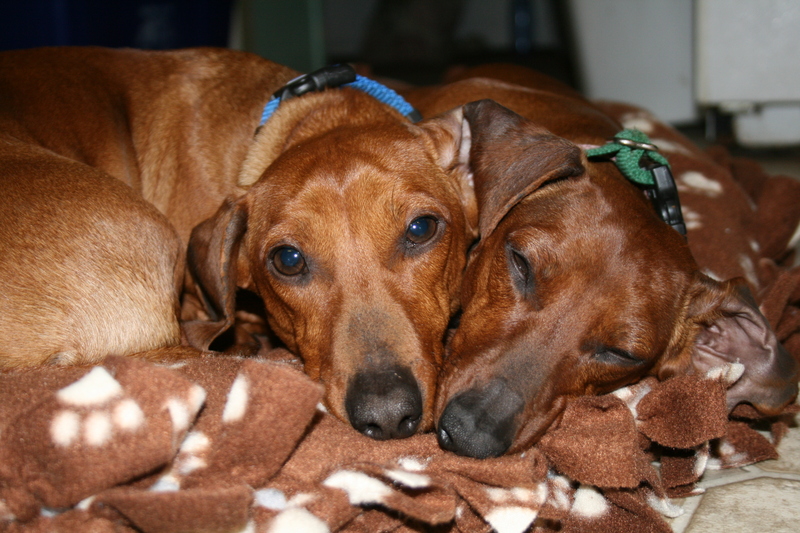 (These are the other loves of my life, Tiller and Trudy and they’re happy to meet you too). Garlic, olive oil, salt and pepper add flavor. 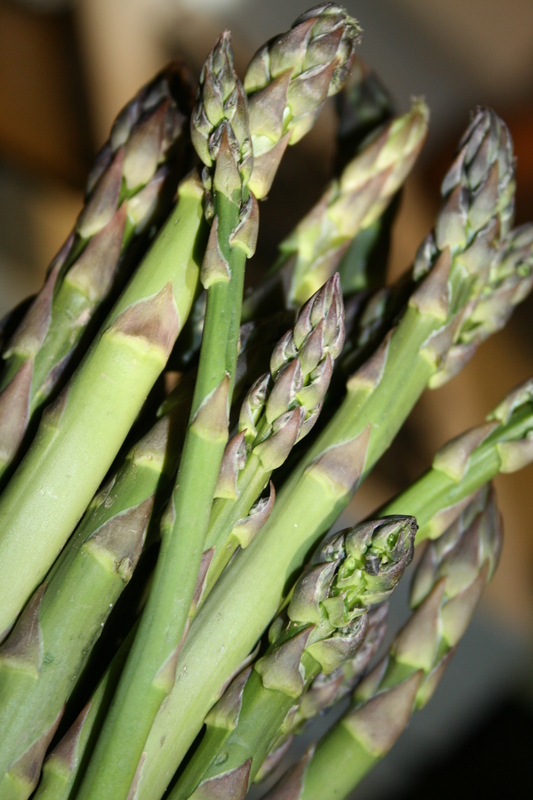 (To the asparagus, not to the puppies). When the spears start to get a little wrinkly and brown, they’re done! Then just top those suckers with the goat cheese and accept praise from your adoring spouse/significant other/roommate/family. Wes says to me, “Mmmm. 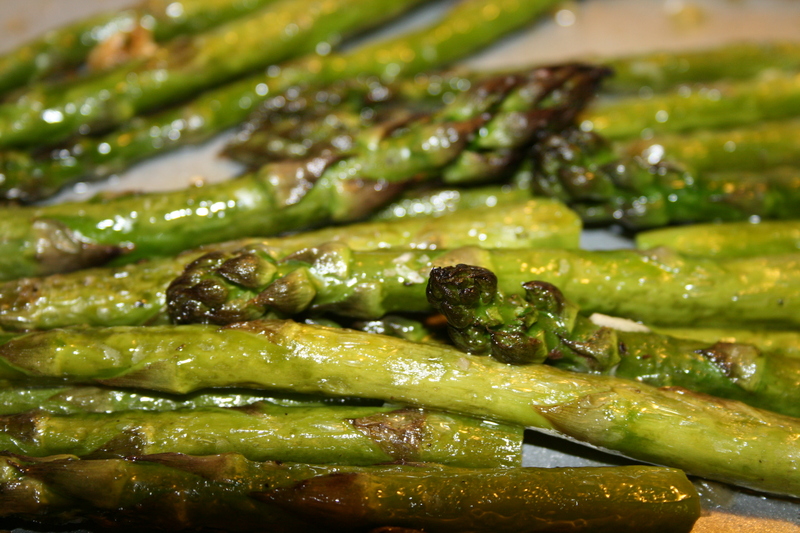 Whatever you put on these is really good.” I didn’t think he even liked asparagus. Do not underestimate the power of a little cheese to make men eat vegetables. This strategy may also work on small children. Preheat oven to 400 degrees. 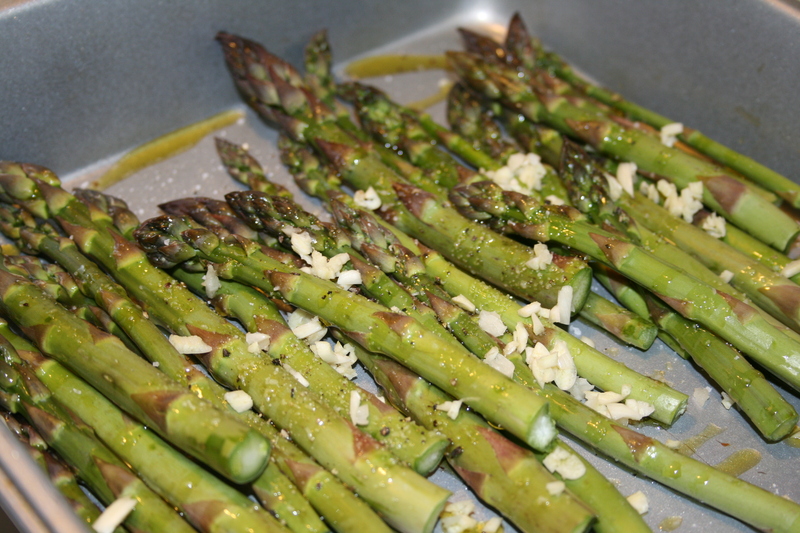 Toss asparagus in a roasting pan with a generous amount of olive oil, the minced garlic, and a pinch of salt and pepper. 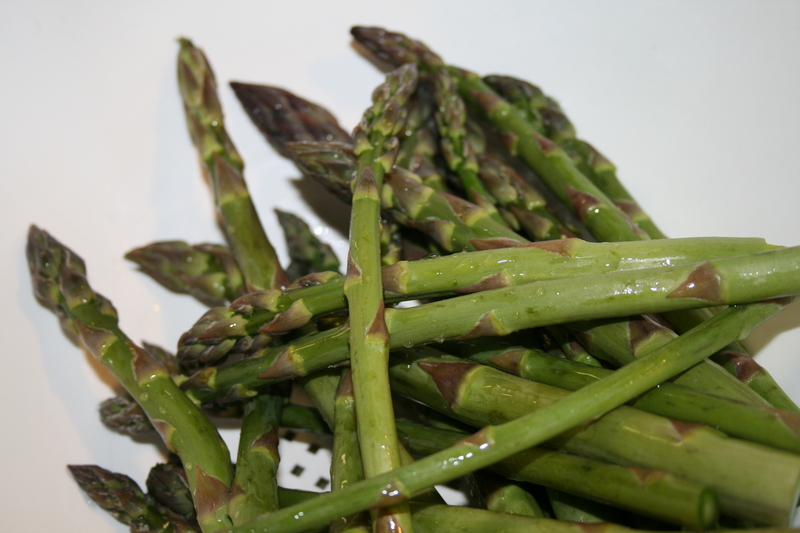 Roast for 10-20 minutes until asparagus is slightly wrinkled and has a few brown spots, tossing once or twice. When done, sprinkle with crumbled goat cheese and serve. Serves 2.